Perhaps spearheaded by the Smorgasburg foodie culture, putting multiple local food vendors in one place has become a recipe for success in NYC development projects. There’s the Hudson Eats food hall at office-filled Brookfield Place, the forthcoming food court by Anthony Bourdain at Pier 57, Danny Meyer’s possible giant food hall at Hudson Yards, the 55-vendor Dekalb Market Hall planned for Downtown Brooklyn’s City Point, and the food hall at Sunset Park‘s Industry City, to name just a few. 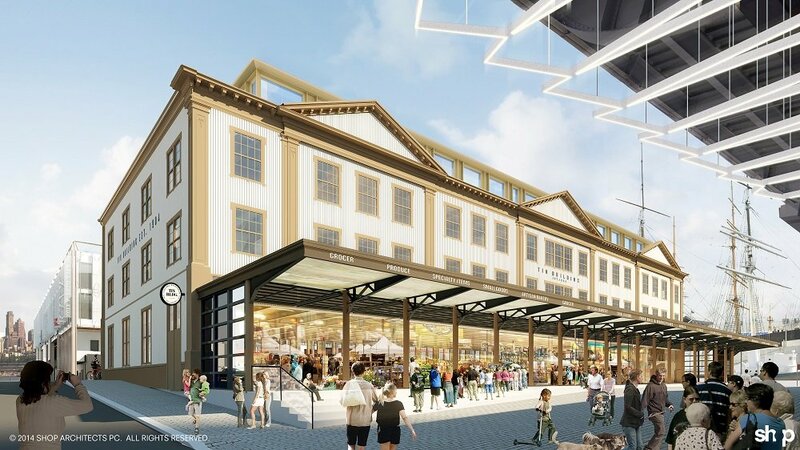 So it comes as no surprise that the South Street Seaport redevelopment will boast not one, but two massive food halls. The Post reports that none other than three Michelin-starred chef Jean-Georges Vongerichten (ABC Kitchen, the Mercer Kitchen, and JoJo are just a few of his famed restaurants) will be spearheading the foodie revolution at the Howard Hughes Corporation’s $1.5 billion mega-development. According to the paper, “The great chef and his business partner Phil Suarez have signed a lease/partnership contract with NYSE-listed Hughes to launch two major Seaport projects — a 40,000 square-foot, seafood-themed marketplace inside the Tin Building and a 10,000 square-foot restaurant in a rebuilt Pier 17.” Both are expected to open in 2017. 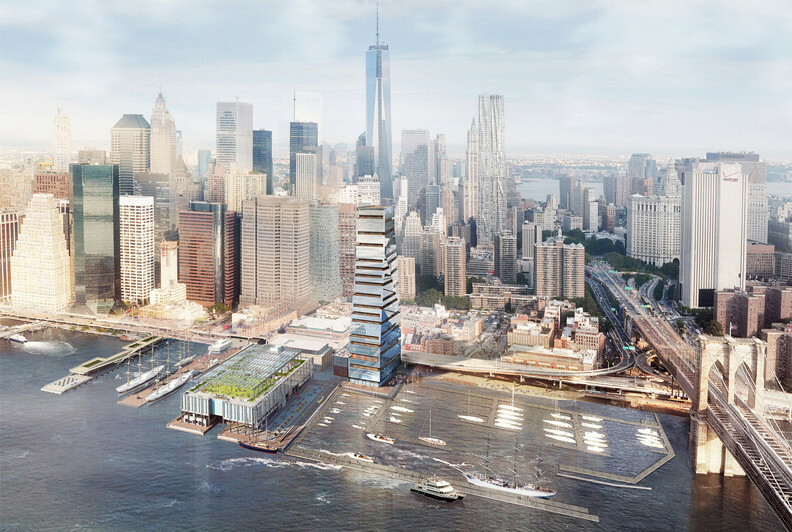 The centerpiece, and most controversial aspect, of the South Street Seaport redevelopment is the SHoP Architects-designed, 494-foot-tall condo tower that will rise on the waterfront at the foot of Beekman Street. David R. Weinreb, chief executive of Howard Hughes, previously said that revenue from the tower would help renovate the landmarked Tin Building, which in May was facing an uncertain fate. The Tin Building, along with the neighboring Market Building, were the original home of the Fulton Fish Market, which makes the new seafood-themed marketplace quite appropriate. In fact, Vongerichten himself used to go to the market several times a week when it was still operating (it’s since moved to the Bronx). He said his new seafood endeavor will have communal tables and counters for “chowders, raw bars, sushi, shrimp.” Similarly, Pier 17 will also be a fairly casual spot, with a 2,500-square-foot, second-floor alfresco patio offering Brooklyn Bridge views. “I am honored to be part of the catalytic transformation,” said Vongerichten.